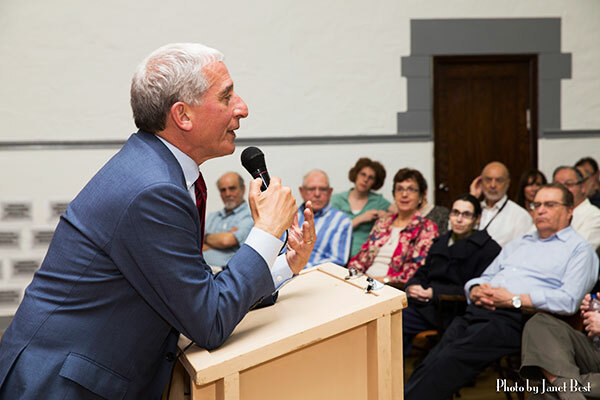 CFPN’s vibrant program of public events has been held in major synagogues and other venues in Toronto, Ottawa and Montreal, and has brought prominent guest speakers to share different historical and political perspectives with the Jewish community and the wider public in Canada. Speakers have included: Prof. Naomi Chazan (former Labour Member of Knesset), Ophir Pines-Paz (former Labour MK and former Minister of the Interior), Yossi Beilin, (former Labour Minister of Justice and co-architect of the Oslo Accords), Ami Ayalon, (former head of Israel’s Shin Bet, and former MK), former IDF senior officers Shlomo Gazit, Maj. Gen. (ret. ), Shlomo Brom, Brig. Gen. (ret.) and Shaul Arieli, Col. (ret. ), Yossi Alpher (Israeli commentator and former Mossad officer), Prof. Sari Nusseibeh, (President of Al-Quds University), Dr. Izzeldin Abuelaish (Palestinian physician and author of “I Shall Not Hate”), Amos Oz and David Grossman, (Israeli novelists), Akiva Eldar, Aluf Benn and Tom Segev (columnists for Ha’aretz newspaper), Michael Karpin (Israeli broadcaster), Irshad Manji, (Muslim reformer), Michael Bell (former Canadian Ambassador to Israel, the Palestinian Authority and Jordan), the late Shira Herzog (Israeli-Canadian commentator), Patrick Martin (Globe and Mail journalist), Yariv Oppenheimer (General Director of Shalom Achshav), Hagit Ofran (Director of Shalom Achshav’s Settlement Watch Program), Mark Rosenblum (founder of Americans for Peace Now); and Daniel Seidemann, renowned expert and activist on Jerusalem. CFPN has also shown ground-breaking films that shed light on the complexities of Israeli-Palestinian relations and present courageous attempts to build bridges between the two peoples. Examples include: The Gatekeepers, Dancing in Jaffa, Encounter Point and Two-Sided Story. CFPN’s events have often been co-sponsored by Jewish institutions such as Reform, Conservative and Reconstructionist synagogues, ARZA Canada, New Israel Fund Canada, Na’amat Canada, the Canada-Israel Committee, Hillel and the Toronto Jewish Book Fair. The organization’s newsletter, PeaceMatters, presents a wide range of interviews, feature articles and opinion pieces on peace-building developments and obstacles. We also conduct regular fundraising activities such as telethons and mail and email appeals to support our Canadian programs and our educational programs in Israel.